If you think the bank bailouts are unpopular in the United States, try the Swiss reaction to the Swiss federal government’s bailout of UBS. It’s to the Voldermortian point where they asked me not to say “UBS” because it’s so embarrassing. We have compromised — I can now say “UBS,” but must then spit three times over my right shoulder to ward off evil spirits. 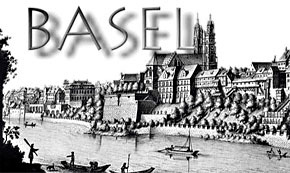 Basel, of course, is the home of the famous Basel Capital Accords, which did approximately nothing to stop our late financial meltdown. In fact, Basel II probably made things worse. So Swiss students have every right to be embarrassed, even if they were only renting their city out to the world’s central bankers, so to speak. OTOH, Basel is also the birthplace of Roger Federer. So they’ve got something to cheer for too.